Mustaches have been around forever, but the current fascination with them is fairly recent. One could attribute it to the growing Movember movement that encourages men to grow out their mustaches in the month of November for prostate cancer awareness. Men may be the ones to grow their 'staches, but women, teens, tweens and kids all love sporting a fake mustache accessory just for fun. That's why a mustache theme party is equally appropriate for a milestone adult birthday party as it is for a teen or child's themed birthday party. Use one of these invitation templates to create an invite to your Mustache Bash. You'll want to add your favorite mustache image to the invitations. 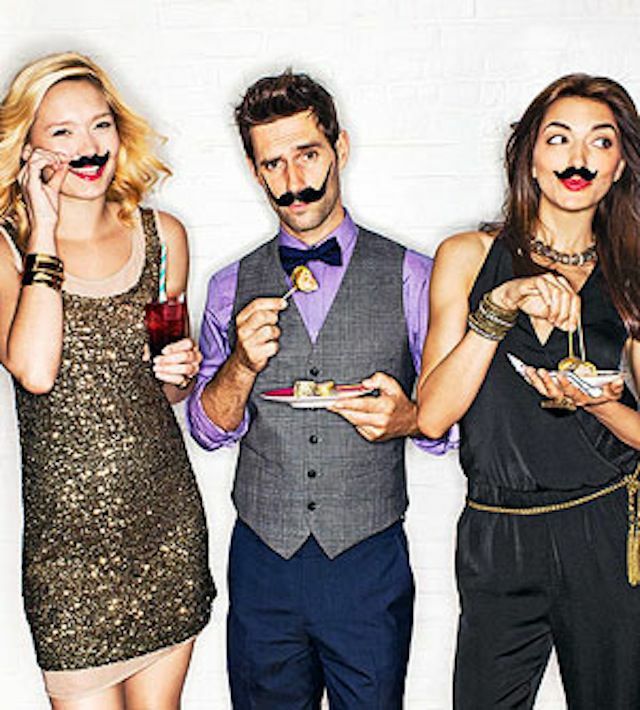 On your invitations, be sure to tell guests that the dress code is "mustache required." Be prepared with mustaches to hand out to guests that forgot to bring their own. Welcome guests to your party with a large sign-in board that has a giant mustache glued to the top. Create a sign-in board by attaching a piece of poster board to a large foam display board, and propping it up either on an easel or chair at the entry to your home. Provide plenty of felt tip markers for creative signatures. Remind guests to add their favorite mustache to their signature. Use mustache theme party supplies for your event. Wrap mustache duck tape around your the back of your chairs. Invite your guests, young and old, to draw pictures of heads wearing crazy mustaches. Ask them to assign a name to their "head shot" and hang it on the wall that you've prepared to serve as your mustache picture gallery. As guests arrive, bring them to your mustache creation station. It's easy with a few simple supplies to create your own mustache. Younger children will need to be supervised as they do this fun craft. Play "guess the mustache". Print pictures of famous mustaches. Find images online and crop the photo to remove everything but the mustache which you can enlarge on your computer. Paste all of the mustaches on a large poster board and write a number next to each one. Hand out sheets of paper with a number on it for each mustache, and ask guests to fill in their best guess for the owner of each mustache. Some famous mustaches include Tom Selleck, Salvador Dali, and Hulk Hogan. Stick the mustache on the face. Draw a large face on a sheet of poster board and tack it to your wall. Give a sticky back mustache in turn to each guest. Blindfold each guest and have them try to stick the mustache on the proper spot on the face. The one coming closest to the correct location wins. Take a photo of each guest wearing their mustache and print it out before the end of your party as a take-home remembrance of your mustache party. Hairy Navels - Greet your adult guests with a Hairy Navel Cocktail. Sandwich Staches - Offer a selection of finger sandwiches that have been cut out in the shape of mustaches using a large mustache cookie cutters. Cookies - Make mustache-shaped cookies using mustache cookie cutters and frost them using brown on ​white royal icing. Mustache Topped Desserts - Whether you serve cupcakes, frosted cookies, cookie cake, or birthday cake it will be easy to decorate for this party theme. Simply use a mustache template to create your own stencil to add small or large mustaches using frosting or powdered sugar to your dessert. Wooly Willy Board to continue experimenting with their mustache designs at home.